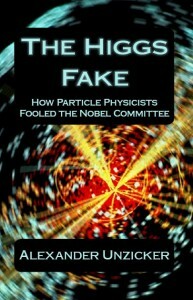 The 2013 Nobel Prize in physics was awarded very soon after the announcement of the discovery of a new particle at a press conference at CERN on July 4, 2012. The breaking news caused excitement worldwide. Yet the message conveyed to the public, as if something had happened like finding a gemstone among pebbles, is, if we take a sober look at the facts, at best an abuse of language, at worst, a lie. What had been found by the researchers did not resolve a single one of the fundamental problems of physics, yet it was immediately declared the discovery of the century. Whether this claim is fraudulent, charlatanry, or just thoroughly foolish, we may leave aside; that the greatest physicists such as Einstein, Dirac or Schrödinger would have considered the “discovery” of the Higgs particle ridiculous, is sure. They would never have believed such a complicated model with dozens of unexplained parameters to reflect anything fundamental. Though on July 4, 2012, the absurdity of high energy physics reached its culmination, its follyhad begun much earlier. I shall argue in my book that particle physics, as practiced since 1930, is a futile enterprise in its entirety. Indeed physics, after the groundbreaking findings at the beginning of the twentieth century, has undergone a paradigmatic change that has turned it into another science, or better, a high-tech sport, that has little to do with the laws of Nature. It is not uncommon in history for researchers to follow long dead ends, such as geocentric astronomy or the overlooking of the continental drift. Often, the seemingly necessary solutions to problems, after decades of piling assumptions on top of each other, gradually turn into something that is ludicrous from a sober perspective. A few authors, such as Andrew Pickering and David Lindley, have lucidly pointed out the shortcomings, failures and contradictions in particle physics in much detail, providing, between the lines, a devastating picture. Though their conclusions may not be very different from mine, I cannot take the detached perspective of a science historian. It annoys me too much to see another generation of physicists deterred by the dumb, messy patchwork called the standard model of particle physics that hides the basic problems physics ought to deal with. Therefore, my opinion is expressed very explicitly in the book. It is written for the young scholar who wants to dig into the big questions of physics, rather than dealing with a blend of mythology and technology. It should demonstrate to the majority of reasonable physicists that the high energy subsidiary is something they would be better getting rid of, because it doesn’t meet their standards. All scientists who maintain a healthy skepticism towards their particle colleagues should be encouraged to express their doubts, and the general public, many of whom intuitively felt that the irrational exuberance of July 4, 2012 had little to do with genuine science, should come to know the facts. Last but not least, it should provide journalists and people responsible for funding decisions with information they need to challenge the omnipresent propaganda. Read more or have a look at amazon. This entry was posted in Higgs, Methodology, Nobel Prize, particle physics, Unsolved Problems by AlexanderUnzicker. Bookmark the permalink. Your book is provocative and I am sure you will be sharply criticized for releasing it. I agree that are too many loose ends in the Standard Model and the Higgs sector for a reasonable theorist to feel comfortable. I recently wrote a brief review on these issues at http://www.vixra.org/abs/1310.0069 (awaiting publication). Your list highlights some of the shortcomings. But there are still worse problems with the SM. I agree, there are many other problems that I did not cover. The sole intent of this brief report is to increase awareness by listing some of the open issues. It is written especially for people not directly involved with the theoretical side of high energy physics. I fully agree with you for two reasons. One is that for anybody who has done regular science and then starts learning these high end physics,starts to feel greatly at unease. While it is easy to see they are doing very similar stuff to regular science but they push the envelope to a very uncomfortable edge. ” I think the main problem of physics is that prior to 1920′s theories were constructed to explain experiments but since the situation has changed. As experiments became more complicated the theory had to lead. While that was ok for a while, however, more and more extravagant theories had to be devised which forced even more complicated experiment (only one LHC) leading to a vicious cycle. All that culminated to String and brothers with no experiment only “Mathematical Consistency”. The second reason is that I have a theory that very much emphasizes your concerns(basic concepts) but I don’t run after them , the theory brings them on from outset. Basically because it is clear that theory is a fundamental theory. As you can see my theory even predicts the proton to electron mass ratio(see the graph). and from it I deduce the size of the proton which comes very close to experimental value. Moreover, there are no quarks the proton is very much like the electron except for its particular left and right particle interaction situation I will elaborate if you are interested. Brilliant article and this should be the eye-opener to CERN and Nobel Organisation. I had communicated following comments to Nobel Organisation when they announced the Nobel Prize for Physics 2013.
dear Alexander, You have written an eye-opener. It is not only critics but also solutions, we all should be aware of these FACTS. But also universities should be warned by teaching our future physicists , so that THEY can take better roads. Very nice book en comment, However, WHAT DID THE LHC MEASURE? What does the 126 GeV result mean? It means in my model, that not the Higgs particle itself has mass, but the local oscillating Higgs field energy (Caismir or ZPE energy) is 126 GeV!! What is mass? it is the abiltiy to change Higgs Field energy (particles) into Graviton energy, so the Higgs itself can have no mass. I have what I believe is the unified field theory. It does everything a unified field theory is supposed to do, like solve the heirarchy problem and calculate ten parameters of the standard model from theory alone. The one thing it doesn’t have, however, is the Higgs particle. Kudos to you for recognizing this without having the answer. My theory can be found by googling “peter gillan physics”. In Science Society it is impolite to not agree with their theories and present new revolutionary. Whatever Universe has in store for mankind, unpleasant as it may be, man has to understand, for ignorance is self-destruction, never better than knowledge. Alexander Unzicker is right. The theoretical physics has gotten lost in bizarre constructs that are completely disconnected from reality. I would like You to explain to me what you measure as a mass ? You see, You do not know. What happened to solving the 4/3 problem of the ultra simple classical electrodynamics? Obviously something is wrong with Maxwell’s electrodynamics, already on classical field level, because of this 4/3 problem of calculating the mass of a ‘point’ charge. It gets worse, there is something wrong with the even simpler magnetostatics theory that is tought on every university on the planet. So do you really understand the most stupid assumption about the stationary electric currents of magnetostatics (and in fact the most stupid assumption of the entire science of physics): they forms “perfectly closed loops”, and check this out, this is described in ALL university text books! Yeah right, and because of this “magical” property of stationary electric currents we find that the mutual Lorentz-Maxwell forces between these perfectly closed current circuits are reciprocal (satisfy Newton’s third law of motion), nothing to worry about here, it is just magical, these closed current circuits. But if you want to do REAL physics, you will have to repair the Lorentz-Maxwell theory of magnetostatics, such that its force law satisfies Newton’s third law of motion also for OPEN circuits of stationary currents (yes, some locations with time varying charge densities exist for such circuits), and by doing this we derive a more general electrodynamics theory which DOES NOT HAVE THE 4/3 PROBLEM. In other words, who needs the Higgs particle in order to explain “mass” if we can solve the 4/3 problem of classical electrodynamics and explain inertia/mass as an electrodynamical phenomenon? http://vixra.org/pdf/1505.0132v1.pdf , however, you can also take the blue pill, and watch these perfectly closed circuits of stationary electric currents (sourced by good old batteries and capacitor banks just like the ones used by Ampere, Gauss, Weber, Faraday, etc …) as a glitch in the Matrix, with your naive eyes spinning around in your head following these closed loops, not knowing that you are a slave in a Matrix world, where Higgs just won the most important price of “real science”. I am glad that some true non-conformist seekers are still resisting the fantasies of modern science. In my opinion, there is an aspect of this science well-rooted in our civilization (its religions, its power structures, etc.) that should be extirpated in order to start all over again. I do not think the scientific popes and their corporative masters behind will agree with any other version of the Universe that departs from their comfortable picture loaded with vulgar materialism.